Hiking to Machu Picchu in Peru via the Lares Trail gives you a unique opportunity to experience a remote, relatively unexplored part of mystical Peru that very few outsiders have ever entered. You will be able to hike the Andes of Peru, explore the spectacular ancient Inca ruins at Machu Picchu and Sacsayhuaman, relax in natural hot springs and experience first-hand the vibrant native communities and indigenous cultures that still live as they have for hundreds of years. Each day of the Lares Trek, we will hike for approximately four hours a day and porters will accompany our trip leaving us free to carry just a day pack. Our Bio Bio Expedition’s camp provides full comforts of a dining tent, full camp kitchen and double-occupancy sleeping tents with your knowledgeable guides and cooks attending to your every need while en route. Along the route you will observe an ancient Andean tradition: the shearing of llamas, carding of the wool, dying with natural colors and the weaving of the cloth into beautiful ponchos performed by llama herders who still wear the clothing styles originally brought to Peru by the Conquistadors from Andalucia in Spain during the 16th century. One the last day of trekking, we will be transported to K,104 of the Inca Trail and trek to the Sun Gate, entrance to the greatest archeological wonders of the world — Machu Picchu. A full day at Machu Picchu the following day provides with the opportunity to hike one hour to the amazing nearby ruins of Winay Wayna or up the dizzying ladder-stairs to Huayna Picchu. Everyone has the opportunity to explore Cusco and acclimatize to the 11,000-foot elevation. A two-hour excursion up to the ruins called Sacsayhuaman is led by one of our local guides. 20,000 men were employed in the construction of this site over a period of fifty years. Here at Sacsayhuaman, you will see stone blocks 8.5 meters high weighing more than 361 tons. It has been said that these ruins are one of the most astounding megalithic structures of the ancient world; however, these ruins are only a preview of what you will see at Machu Picchu! For today’s dining, you are on your own to choose from one of the many tipico restaurants around town. Cusco is a shopper’s paradise, where you can choose from a myriad of Peruvian hand-crafted goods to bring home as gifts or souvenirs. Overnight stay is at the Hotel Picoagua (no meals included). 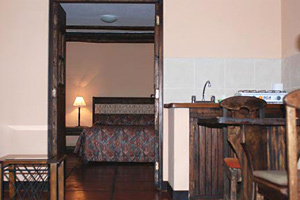 We will overnight at the beautiful lodge Mirador de las Incas – a private inn on the banks of the Urubamba River. Our walk starts at Huarán community, 60km away from the Sacred Valley of the Incas. We ascend a fertile valley for a period of 4 hours, following Huarán river and passing by local crop fields to finally reach the community of Cancha Cancha (11’000 feet). At this town houses are built entirely of stone. Our camp will be waiting ready for us on the outskirts of this community. The starting point is Cancha Cancha, we continue climbing up until the Abra of Pachacutec (Elev. : 4710 meters.-Approximately 15,000 feet), where we will appreciate much of the Cordillera Urubamba, above the snowy peaks of Pitusiray, Sahuasiray, Colquecruz, Chicon and Helancoma. Afterwards we descend to the highland lakes of Condereancocha and Hatuncocha for lunch, while we appreciate the beauty of the landscape. We continued for another hour to reach the house of Mauro Quispe, original Quiswarani community and friend. (Elev. : 3870 meters – about 12,350 feet.). He will give us a warm welcome and we camp next to his house. Today, the doors of the house of Mauro will open for us. We have the opportunity to meet his family, share the morning with them and learn more about their lifestyle. They work the land and livestock for subsistence and are also very skilled weavers. We say goodbye to the family Quispe and continue trekking down our route to Lares Valley. Once we get to the road, we will drive 30 minutes to our lunch spot, before Lares pass. Then, we will continue driving to the Sacred Valley where we rest up for the Inca Trail the next day! In the morning we transfer from our hotel in the Sacred valley to the train station located at the village of Ollantaytambo to Km 104 of the railway, the starting point of our trek. First we pass by the ruins of Chachabamba and then begin a four-hour ascent. Along, we have a spectacular view of the Urubamba Valley to finally reach the magnificent ruins of Wiñay Wayna (Forever Young). From this point we continue our tour by one of the best preserved sections of the trail, through a wet cloud forest full of variety of flora and fauna. Finally we cross the entry of Intipunku (Gate of Sun) after which, we find an unforgettable sweep of natural beauty and human artistry: the magical city of Machu Picchu. Early morning bus to the incredible ancient Inca city of Machu Picchu. We will explore this man-made wonder of the ancient world with a knowledgeable guide that will introduce us to the fascinating city and the culture that inhabited it. We then catch our afternoon train back to Cusco. After checking in to the Picoaga hotel we will reconvene for a festive farewell dinner to celebrate a successful journey into the heart of the Andes! Fly to Lima and transfer onto International flight – If you have more time please ask about one of our trip extensions. Options include: Amazon Jungle tour, Mountain biking the Andes, Lake Titicaca, or Nazca lines. You will be provided with one soft duffle bag when you arrive to Cusco to pack all your gear for the Lares Trek. The porters will carry this duffle bag. Your suitcase will be left at the hotel with non-trekking clothes and items – while your suitcases are kept in safe storage we still recommend using a lock on your suitcase. Keep all important documents, including your passport, with you in your daypack. Please note that your Lares Trek bag with your camping gear will have a weight limit of 18 lbs! This is required by law in Peru to protect the porters. That does not include your tent which will be carried in a different bag. At the end of the Lares Trek, each client should tip the porters $75-100. This will be divided up among the 20-30 staff that have made your Inca trek possible. • Explore the ruins of Sacsayhuaman — one of the most astounding megalithic structures of the ancient world. • Travel to the Sacred Valley — home of multiple ruins, a bustling Indian market and the Urubamba River. • Mountain bike through beautiful countryside and explore the ruins of Maras and Moray. • Hike through the stone-and-thatched-roofed huts of ancient Andean villages. • View the stunning glaciers, waterfalls, lakes and native wildlife of mountainous Peru. • Take part in a village feast of lamb cooked in a centuries-old tradition. • Soak in the hot springs at Lares. • Observe the traditional llama-shearing and wool-weaving of the striking, bright red ponchos endemic to the Peruvian Andes. • Explore the ancient, mountain-top Inca ruins of Machu Picchu with a knowledgeable guide.